Born in New York City, USA, Alan Seid grew up bilingual/bicultural in Mexico City, Mexico. He is a CNVC Certified Trainer and he has been studying Nonviolent Communication (NVC) since 1995. He has trained primarily with the founder of the process, Dr. Marshall Rosenberg, Ph.D .while also attending many workshops with other trainers. Alan brings a lively and engaging style to his trainings, combining humor, exercises for practice, a deep understanding of the theory behind the process, and a keen sensitivity to individual and group needs. Alan has a university degree in Sustainability—the long-term health and vitality of people and communities in economy, ecology and culture. 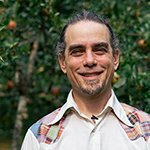 He also holds a certificate in Permaculture Design, which he practices where he lives with his wife and daughters on 25 acres in the foothills of Washington State’s North Cascade Mountains, USA. Alan offers workshops in Permaculture Design, Financial Integrity (Your Money or Your Life), Integral Sustainability (based on Ken Wilber’s work and the 8-Shields Model, also known as the Acorn Model). In addition to his trainings, Alan offers meeting facilitation through Cascadia Workshops.